Sam Masich is one of few instructors in the world today who teaches Full Curriculum Yang-style Taijiquan. As the most widely practiced variant of taijiquan, modern day Yang-style can seem either like a rich potpourri of possible flavours and textures or an interminable maze of contradictions. The Yang family art has been evolving for generations and there are great differences among inter-generational family members. In his 'Masich Internal Arts Method' approach to the art, Sam uses, as a broad guideline for curriculum, Chen Yanlin's seminal 1943 work 'Taiji Boxing, Sabre, Sword, Pole, Sparring Compiled' (Taiji Quan, Dao, Jian, Gan, Sanshou Hebiān 太極拳刀劍桿散手合編). 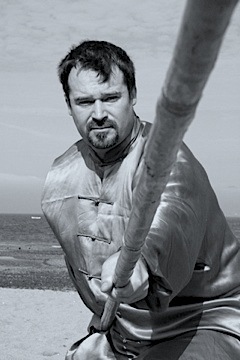 Sam augments this classical program with compatible material drawn from a deep well of experience and research including: studies with some of the top taijiquan masters of the past two generations; extensive research into archival material; study of classical taijiquan literature; cross-referencing with related disciplines; competition; and prolonged periods of workshopping curriculum. Sam Masich began training intensively in 1980 with Brien Gallagher, the first certified 'High-Class' Master student of Grandmaster Master Raymond Chung. This indoor apprenticeship would last seven years during which time Sam mastered the full Yang-style Taijiquan curriculum as taught by Gallagher from Master Chung. In 1985 Master Chung, in a two month long series of private sessions, checked, corrected and approved all Sam's forms and push-hands in preparation for his participation in the 'First World Wushu Invitationals' in Xian, China. While in China, Sam studied push-hands and taiji neigong privately and intensively with Master Men Huifeng in the Beijing Physical Culture Institute. 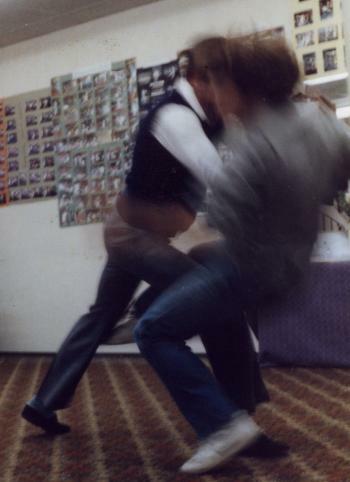 In 1985, still during his apprenticeship with Brien Gallagher, Sam began private studies with Master Shouyu Liang which included Chen-style Taijiquan, Baguazhang, Xingyiquan and various forms of weapons and external styles training. 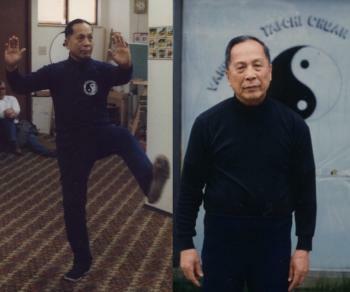 Also, in the mid-80s, he began studies with Dr. Yang Jwing Ming in various advanced aspects of Yang-style Taijiquan, including: bare-hand and sword applications, push-hands, neigong/qigong and qinna. Sam is a formal disciple (tudi 徒弟) of both Liang Shouyu and Yang Jwing Ming. 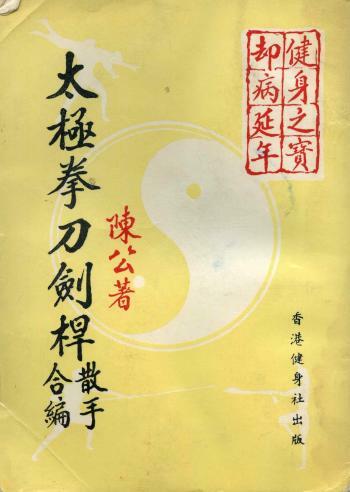 Sam also received much tutelage and guidance in Yang-style Taijiquan solo form, push-hands and principle, and in Daoist ritual ceremony, from Master Jou Tsung Hwa from 1988 until the time of his death in 1998. 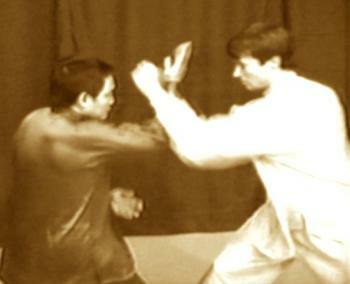 In 1990 Sam began augmenting his yang-style training under the tutelage of Yang family members Master Yang Zhenduo and his grandson Master Yang Jun. He studied bare-hand form, sabre, sword and push-hands with these Yang masters in seminar format in the United States. In 1994, Masich was a member of the North American Martial Arts Exhibition Team led by Master Liang and Dr. Yang which toured and performed in China for two months. After the tour, Sam went to Shanxi, Taiyuan for private training and practice in sabre and push-hands with Yang Jun and was approved for participation in a closed-door seven day instructors training session led by Yang Zhenduo. Class participation was otherwise restricted to authorized instructors living in Shanxi Province. 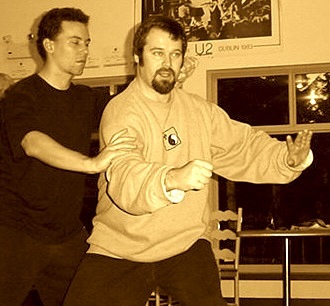 Sam's unique approach to the art of Yang-style Taijiquan has been appreciated by students around the world. A good number have studied the Yang corpus through regular classes, weekend seminars and the 'Yang-style Taijiquan Full Curriculum Intensive,' a three month course which was first held in 2001-02 and again in 2008-09. In terms of time, effort and commitment, studying the Yang-style Taijiquan Full Curriculum might be likened to doing a Master's degree program. Sam makes this enigmatic process comprehensible with a focused and articulate teaching style that consistently puts content into context. 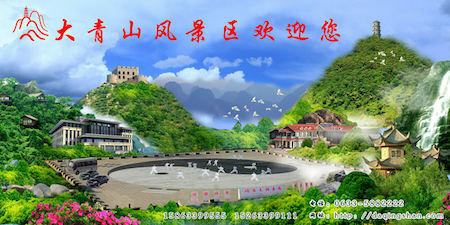 In July 2016 advanced aspects of the Masich Internal Arts Method Yang-style Taijiquan program are being presented at Daqingshan Mountain in Shandong, China. The 2016 Yang-style Taijiquan Full Curriculum Intensive Level II is a certification class for taijiquan players already versed in the full curriculum of Yang-style Taijiquan as taught by Master Sam Mach. Summer 2016 Intensive in China! 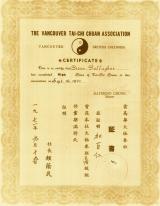 1971 Certificate 'High -Class' in Yang-style Taijiquan for Brien Gallagher from Master Raymond Y.M. Chung (The Vancouver Tai-Chi Chuan Association). 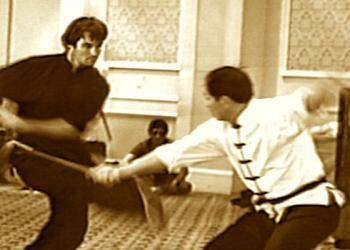 Brien began his studies with Master Chung in 1963. 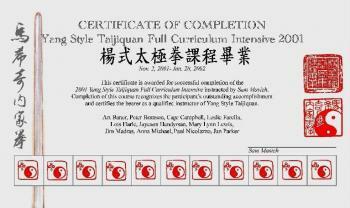 2009 Certificate of Completion for graduates of the three month Yang-style Taijiquan Full Curriculum Intensive in San Miguel de Allende, Mexico with Sam Masich. 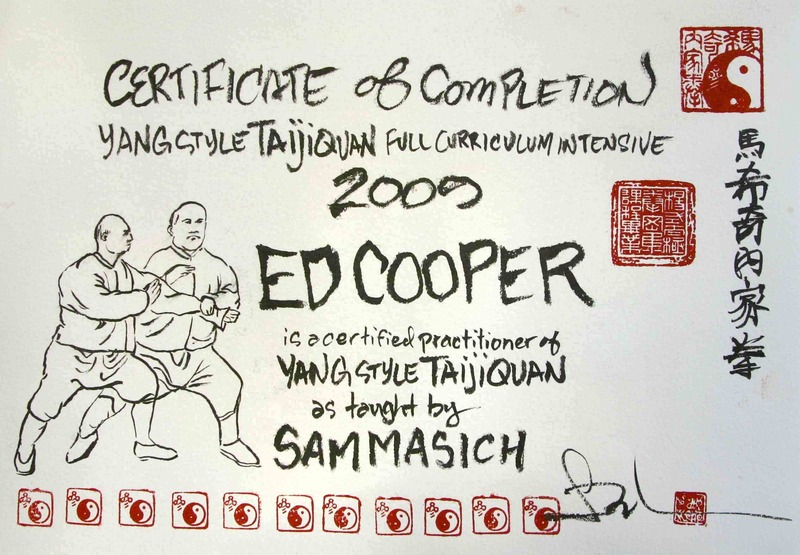 2002 Certificate of Completion for graduates of the three month Yang-style Taijiquan Full Curriculum Intensive on Bowen Island in British Columbia, Canada with Sam Masich.